The Sinakekela Sibusiso Semanti Learning Network is mainly situated in the Nkangala, Gert Sibande, Ehlanzeni North and Ehlanzeni South District Municipalities of Mpumalanga although the Learning Network would like to expand across the whole Province in future. It is associated with the Training of Trainers course being implemented with the University of Mpumalanga as its hub. The University of Mpumalanga is committed to developing as an African University providing leadership in knowledge creation and dissemination. The University’s short course unit which links to the community engagement arm of the university the University of Mpumalanga will act as lead co-ordinator of the Training of Trainers programme with Rhodes University. Mobile Agricultural Skills Development and Training (MASDT) is a non-profit company that runs a training and incubator programme, through a comprehensive and integrated range of support services in agriculture, to empower emerging farmers located in often remote rural areas in Mpumalanga, South Africa. The Association for Water and Rural Development (AWARD), aims to develop, test and inform new and appropriate ways of managing water and biodiversity so as to contribute to sustainable futures that promote the dignity of all. Forming part of the network is fitting as building active civil society participation in wise water and biodiversity stewardship, management and governance is part of their vision. The Departments agricultural advisors and agricultural trainers participating in the network are a crucial link for integrating Rain Water Harvesting and Conservation in the Departments mission to facilitate integrated, comprehensive and sustainable development and social cohesion by participating and partnering with all sectors of society, through agriculture, rural development and land administration. 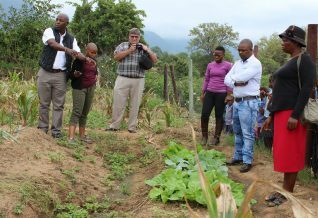 NewsHorn offers the latest News and Breaking News from Mpumalanga to Mozambique featuring local Agricultural content and thus able to share knowledge on Rain Water Harvesting & Conservation with and from the network. The farmers currently in the network are homestead food producers and emerging and aspiring commercial farmers, young and old with many interesting stories, experiences and values to share with the rest of the group and province at large. If you are interested in becoming part of the Sinakekela Sibusiso Semanti Learning Network through the Nkangala, Gert Sibande, Ehlanzeni North, Ehlanzeni South, the University of Mpumalanga or UMP Enactus learning groups or would like to set up a Learning Network in your area, please contact Amanzi for Food.